Dean Worcester’s images of the Philippines circulated widely in the United States, from the halls of Capitol Hill in Washington to the St. Louis World’s Fair of 1904 to the parlors of middle-class Americans. As they circulated, the images changed—and even when they didn’t, the changing contexts of their presentation told new stories about the American colonial experience. Photographic images moved from the darkroom to the printed pages of official state documents, most notably with the publication in 1905 of the Census of the Philippine Islands. Here the surveillance powers of the state that had been so crucial in pacifying the islands now joined with the documenting, collecting, and classifying impulses of the anthropological gaze. Tracing one photographic encounter as it moved from Dean Worcester’s field work to its other public uses shows how the uneasy but necessary intimacy of the colonial encounter was frequently stripped away by the time images circulated back to the metropole and were put to other political uses. 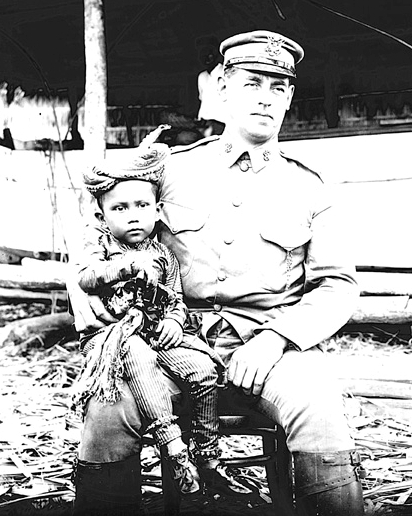 In this 1905 photograph, E. Y. Miller, an officer in the U.S. Army and the colonial governor of the Palawan province, holds on his lap a Moro child. 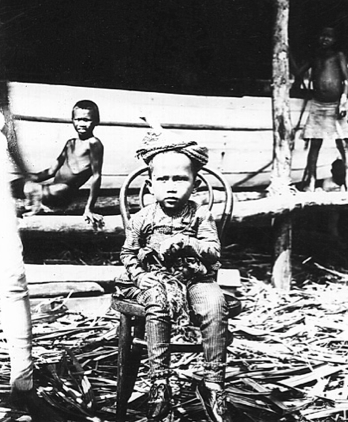 The boy was the son of Datu Batarosa, a powerful local chief with whom Miller would have worked on a regular basis. A photo of the same boy with other children in the background creates a different impression. Miller drowned in 1910, and Worcester’s annual report as secretary of the interior reproduced this image as its frontispiece, noting that the “provincial service and the work for the non-Christian inhabitants of Palawan have suffered an irreparable loss.” Worcester’s image of Lieutenant Miller extended one man’s benevolence to that of the entire American colonial undertaking. 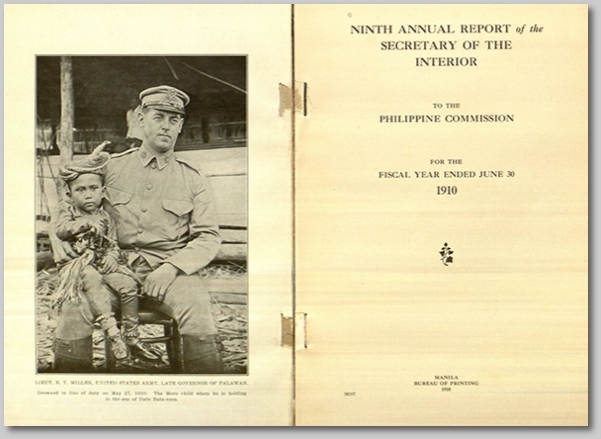 Title page and frontispiece, Ninth Annual Report of the Secretary of the Interior to the Philippine Commission for the Fiscal Year Ended July 30, 1910 (Manila: Bureau of Printing, 1910). In November 1913, National Geographic featured a hand-colored version of the photo. The caption focuses on the Moros, describing them as “treacherous and unreliable” and stresses the need to bring them under control. By now, Captain Miller’s photograph has begun to tell a new story, much less personal, more simplified, and far out of Dean Worcester’s power to control. Worcester’s visual extravaganza wowed not only the crowds at his lectures, but government officials as well. One of the final stops on Dean Worcester’s U.S. speaking tour was in Washington, D.C., where he appeared before the Senate Committee on the Philippines. His testimony was both oral and visual: on December 30, 1914, he lectured the senators for two hours in a darkened committee room illuminated by the glow of his lantern slides. As the photographs that Dean Worcester and others took in the Philippines were collected, sorted, and circulated throughout the United States, one style emerged as a visual habit that shows the power of photography as its anthropological aims were put to storytelling ends. 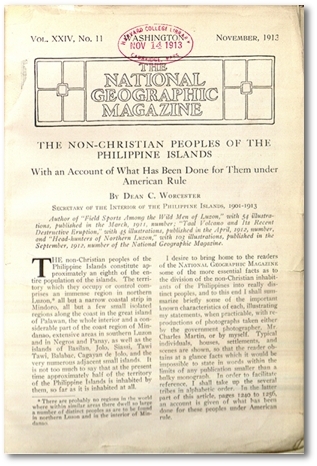 Published works about the Philippines—by Dean Worcester or others—regularly featured images of transformation, both of the Philippine landscape and its inhabitants: a paved road replaces a meandering footpath; a modern schoolhouse stands next to a thatch-roofed hut; a long-haired boy returns as a white-suited man. The visual trope of sequential transformation was among the most popular ways of depicting America’s colonial enterprise, appearing in books, magazines, and even in official government reports. Putting images in a sequence creates a narrative—with a beginning, a middle, and an end. In an era that cherished progress, uplift, and evolution as keywords of civilization, photographic sequences told persuasive stories to Americans about the nation’s new imperial endeavors in the Philippines. 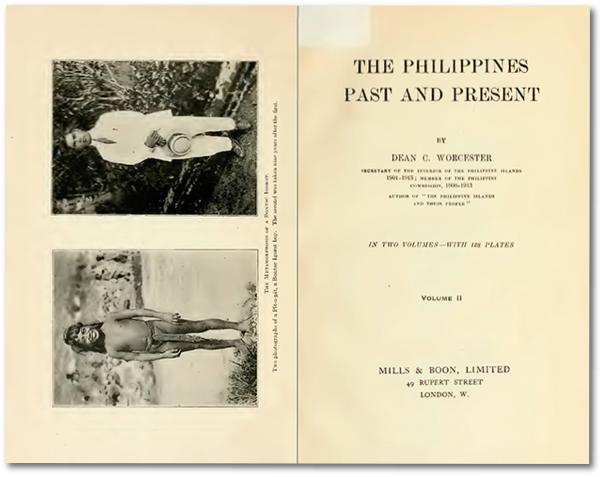 Several can be found in Dean Worcester’s massive account of U.S. colonial policy, The Philippines: Past and Present, published in 1914 (below). The text explains that the man became a doctor. 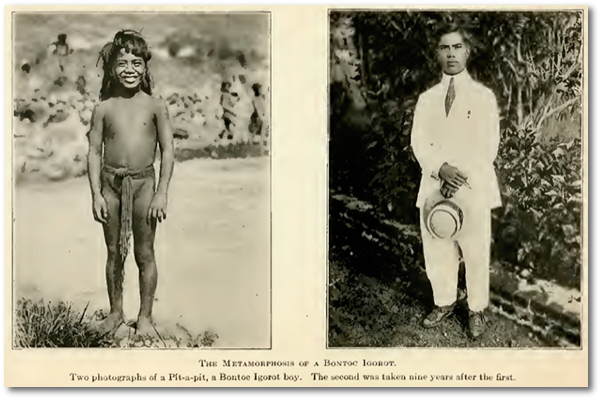 By including the contrasting images of a barefoot boy and a white-suited man as the first pictures in his book, Dean Worcester presented images as evidence of the achievements of the colonial project. 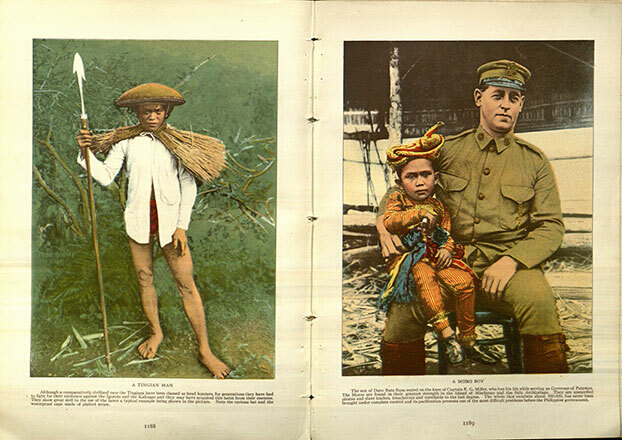 The Philippines Past and Present (1914). Dean Worcester not only used images to document personal transformation, but also the remaking of the Philippine landscape. Roads, bridges, trains, and farm equipment appear in his photograph collection as signs of modernization. 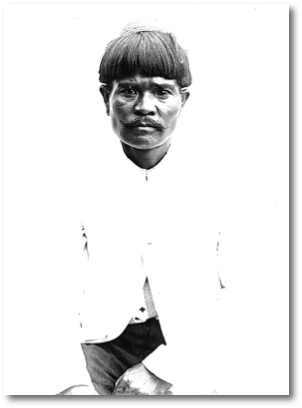 Bakidan was a Kalinga chief whom Worcester knew well from his travels in the mountains of Luzon. 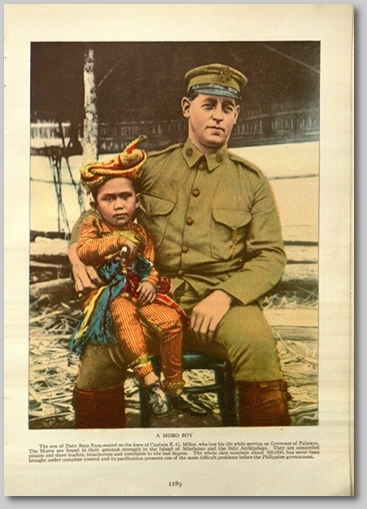 Over time, however, as Worcester published accounts of his time in the Philippines, descriptions of his relationship to Bakidan changed from depictions that highlighted close and personal relations to stories that erased Bakidan’s individuality and highlighted his tribal and “savage” identity. 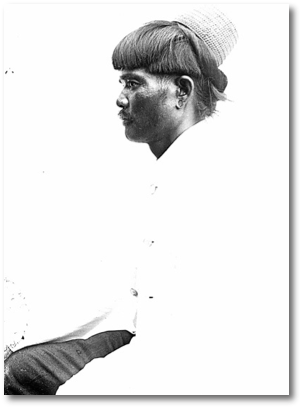 This photograph of Bakidan, a Kalinga chief, was taken in 1905 during an extended stay by Worcester in the village of Bunuan in the northern Philippines. 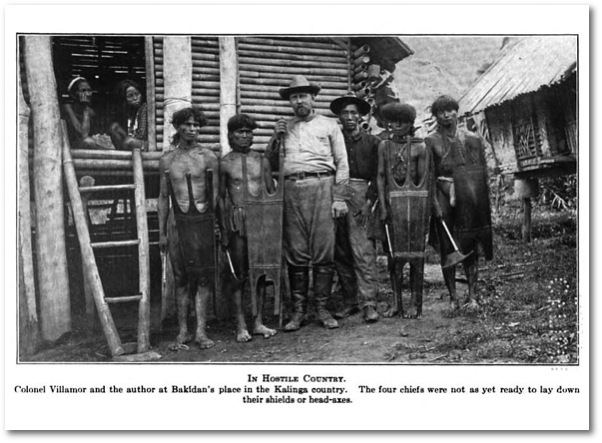 Worcester reproduced this image of Bakidan in The Philippines Past and Present with a caption stating that he “saved the lives” of Worcester and others during their first trip to Kalinga country. Taken during his 1905 journey to Bunuan, this photograph shows Bakidan (highlighted in red) with three other chiefs, and, at the center, Worcester and Colonel Villamor. These four chiefs appear elsewhere in Worcester’s photographic collection, but not identified as chiefs or brothers. Worcester’s caption: “Blas Villamor, Bakidan, Saking, and two other brothers of Bakidan, and myself. There are six brothers in this family and they rule the upper Nabuagan River valley. Bakidan is the most powerful,” 1905. Sometimes the images in the Dean Worcester collection were simplified or altered by Worcester to serve his own political ends—he took them for political purposes, of course. But Worcester—a politician, anthropologist, scientist, and photographer—was unique. 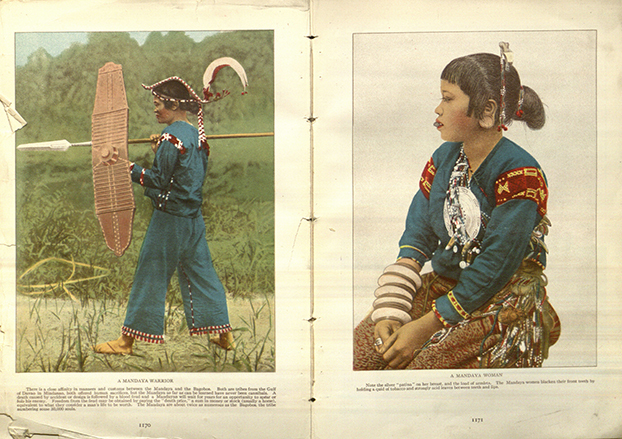 Sometimes images of Filipinos were used by other authors and publishers, many of whom had little connection to the Philippines and felt less compunction about playing fast and loose with the photographic record. 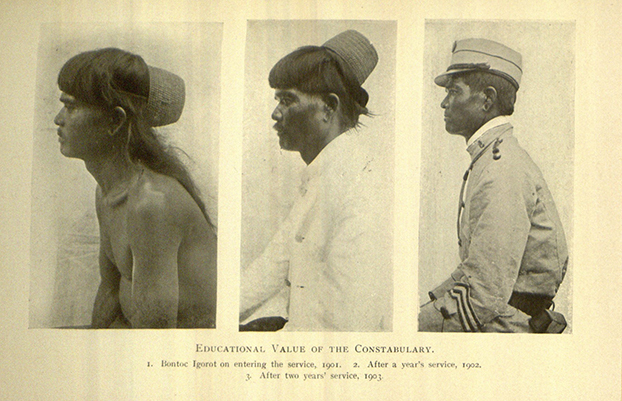 Consider the following depiction of the “educational value of the constabulary,” published in Frederick Chamberlin’s The Philippine Problem, 1898–1913 (1913). 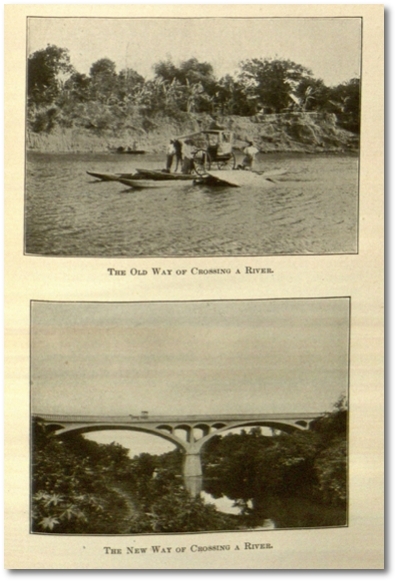 This sequence of photographs was published in the 1910s both in a government report and a popular account of U.S. Philippine policy. At first glance, the series appears to tell a story of benevolent colonialism by tracing the transformation of a soldier after “a year in jail.” But the photographic archive suggests a more complicated history. Illustration in Frederick Chamberlin, The Philippine Problem, 1898–1913 (Boston: Little, Brown, 1913). This sequence was a famous image of U.S. colonialism in the Philippines, depicted in government documents and popular publications. But when we trace the narrative back from the printed page to the moment of photographic encounter, the story gets more complicated. Worcester’s notes and archives tell a different story of transformation, in which he took four different photographs in 1901, and only arranged them much later in a sequence with a narrative of colonial uplift. 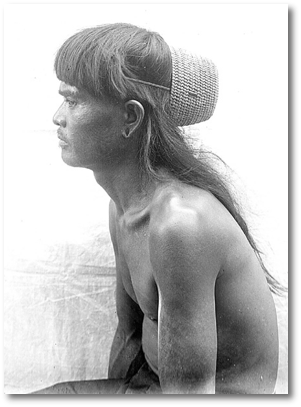 “Bontoc Igorot man, type 5. Half length profile view,” 1901. 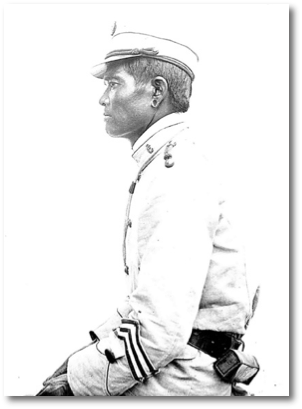 The second photograph of the sequence—along with the one shown below—were both taken in Manila in June 1901, and thus could not have reflected “a year’s service” in the Philippine Constabulary, as the series caption claimed. 2/3 length profile view,” 1901. The front view of this man, clearly taken at the same time as the middle picture above, allows his face to be seen. Half length front view,” 1901. It is unclear when or where the third photograph in the sequence was taken. 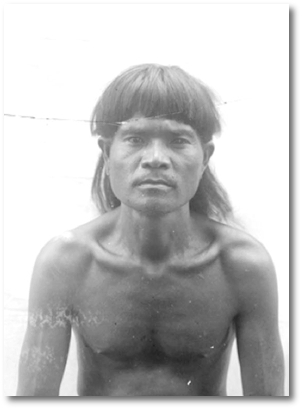 It may have been taken in Manila in 1901 or in the highland province of Bontoc in 1903. While this appears to be Francisco, the same man depicted in the first of the three photographs of the sequence, it was not taken “after a year in jail,” as Worcester reported in published writings accompanying these images. After a year in jail. In his diary for June 21, 1901, Worcester noted that “Francisco had on a full rig of cloths [sic]—white coat, trousers made out of a pair of miner’s Alaska drawers, army leggings and American shoes,” closely matching this image of a constabulary uniform (above). 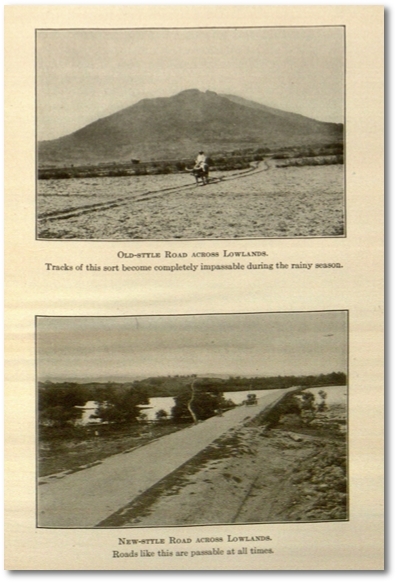 But in Manila that June, Worcester also photographed Francisco in a more “primitive” state (right). These images show the power of photographic manipulation, and cause us to ask why an author might have wanted to shuffle photographs in service of a good story. 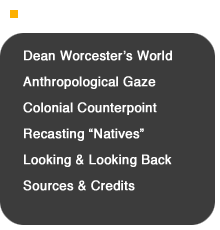 But they also make us wonder whether Dean Worcester was not so much a puppet-master but also entranced by his own narrative of colonial control and uplift. Evidence suggests that he only put the images into this narrative in a government report in 1910, but that he used the images quite often afterward, even in his congressional testimony in 1914, when he told Congress that “I will show you the evolution of the first Bontoc soldier who ever enlisted…. This man is a chief named ‘Francisco,’ dressed as he had been when I first saw him. [indicating] This slide shows how he looked a year after, after he had been in contact with the Americans.”  Colonial storytelling was a complicated matter that was never entirely under the storytellers’ control. 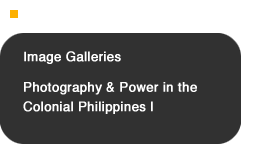 The blend of the scientific and the touristic, the official and the private that marked colonial Philippine photography reached its apotheosis in the pages of National Geographic, the iconic magazine that brought the world to the parlors of Victorian America. 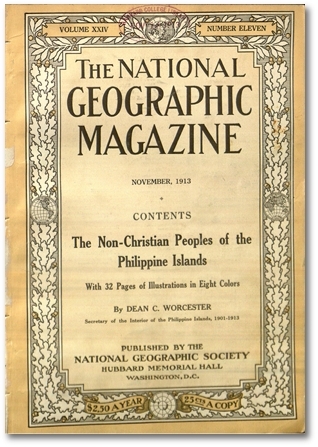 Founded in 1888, the National Geographic Society initially found few readers for its dry and scholarly publications. But subscriptions to The National Geographic Magazine skyrocketed after the U.S. embarked on overseas colonization, and a revolution in printing technology enlivened the pages with photographs—many of them painstakingly tinted and reproduced in full color. 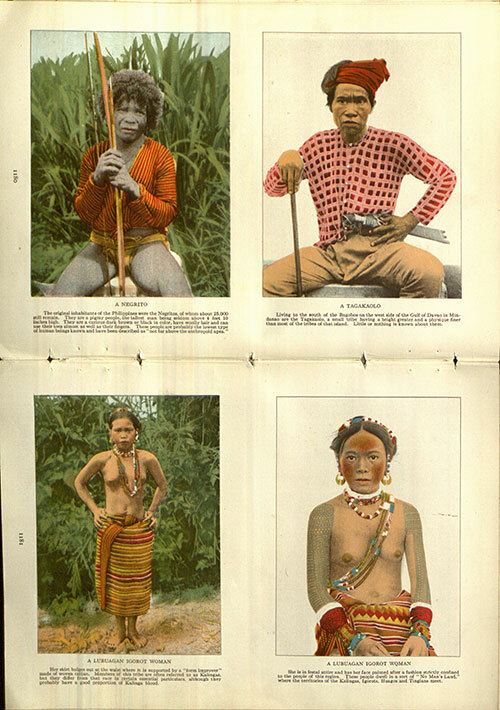 Articles on the Philippines appeared with regularity after 1898—over 30 were published between 1898 and 1908—and photographs from Dean Worcester’s collection illustrated many of them. The connections between Worcester’s entourage and the National Geographic Society were thick and deep: photographer Charles Martin, who appears often in Worcester Collection photographs (he took many of them as well) became head of the NGS Photographic Laboratory in 1915 after he left the U.S. Army. In the pages of the magazine, Worcester shared his familiar stories of colonial uplift, and readers delighted at the array of images that illustrated his articles. 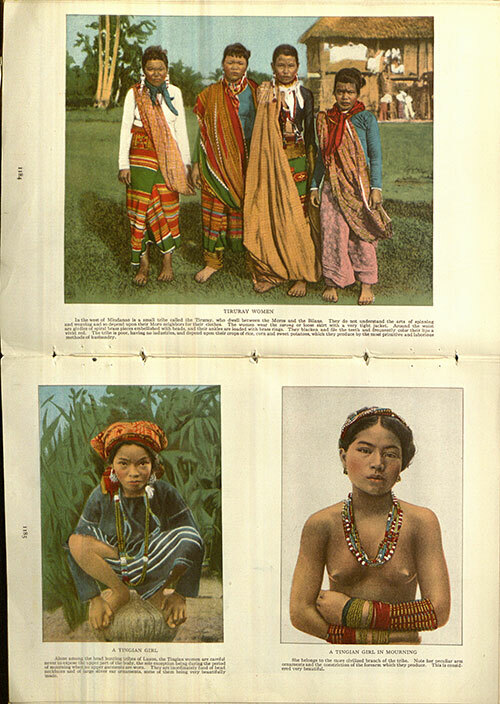 His photographic essays were not without controversy, however; a 1903 article by another author that depicted bare-breasted Filipina women prompted debate among the magazine’s editors about its propriety. Worcester made a claim for the images’ scientific value, won the argument, and revolutionized the magazine’s editorial practices. 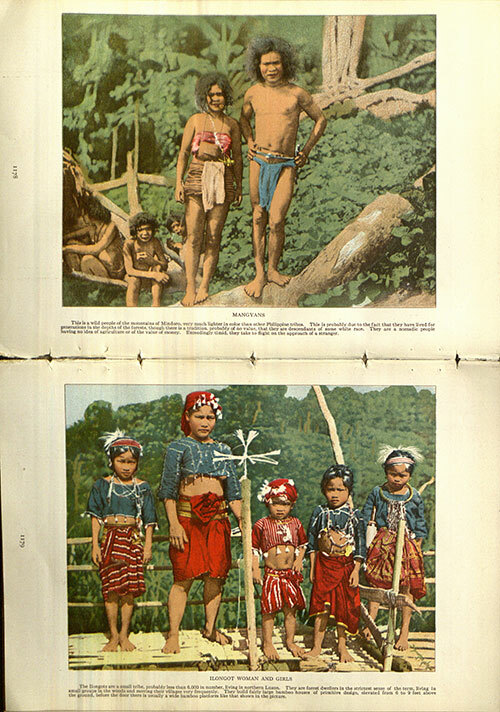 National Geographic juxtaposed the familiar and the exotic in an article by Dean Worcester, with a run of hand-colored photographic illustrations of rural Filipinos. 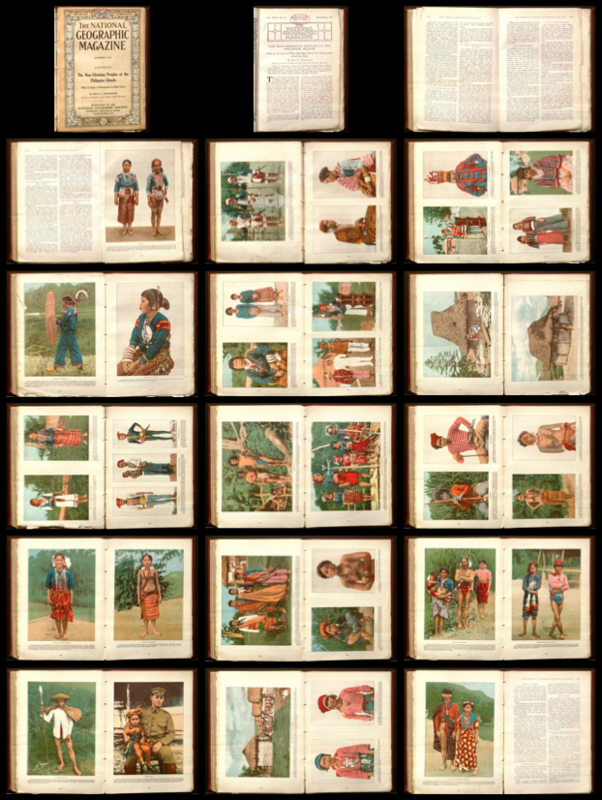 Thumbnails show the layout of the photographs selected and colorized for Worcester’s article. 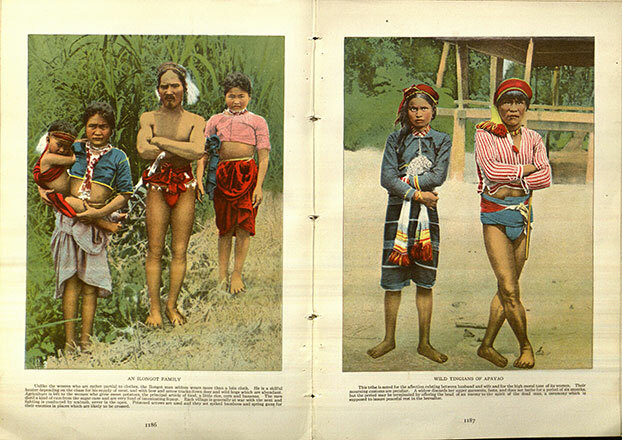 Through his text and images—carefully hand-colored by National Geographic staffers—Dean Worcester conveyed to a mass audience of American readers his sense of the racial landscape of the Philippines and boasted of “what has been done for them under American rule.” The images selected for his November 1913 National Geographic article introduced appealing figures representing tribes rather than individuals; vibrant colors accentuated the sense of the exotic for American readers.